Looking to replace your old carpeting? 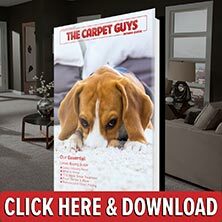 Book a free carpet installation estimate with The Carpet Guys and renovate your floors today. We carry the most popular styles of carpet on our shelves, and they are ready to be put on your floors. With over thirty years of experience, we strive to provide customers with the most professional service possible. To make sure you get the best carpeting available, our products are all bought directly from top leading manufacturers. Get your free estimate booked with The Carpet Guys today. We have what it takes to professionally renovate your home, and we guarantee your satisfaction. Adding new carpet to your home is one of the best investments you can make. It provides any room with extra warmth and comfort that no other flooring type will. When our crews arrive at your home, they will begin by moving the furniture for you free of charge. After your room has been cleared of your valuables, the old flooring will be ripped up. This is also done for you at no extra cost. Once the old flooring has been bundled up and placed outside by the curb, new carpet pad is rolled out and the fresh carpeting is installed on top. After the install has been completed, they will put the furniture back in the original layout you had it in. Don’t wait any longer to get your old carpeting renovated. Schedule your free in-home estimate with The Carpet Guys today and get started.